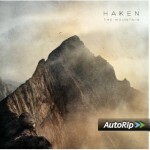 Share the post "Album review: HAKEN – The Mountain"
This is Haken’s third album, although they only came across my musical radar after seeing an excellent performance at this year’s Celebr8.2 prog festival. This is a concept album about each everyone’s personal mountain they have to climb in life and Haken have some interesting takes on this contained in the music. The band’s secret weapon is vocalist Ross Jennings, who has a marvellous melodic vocal that is at ease on the quieter refrain of ‘The Path’ through to heavier music like ‘Cockroach King, a real progressive tour de force. Listen out for the keyboards/sound effects on this one, verging from jazz through to full on pomp moments. ‘In Memoriam’ ramps up the metal quota as guitarists Richard Henshall and Charlie Griffiths to come to the fore and like the rest of the album they don’t drown out the rest of the music. Speaking of vocals the band utilise some amazing choral and vocal passages. ‘Because Its There’ is simply wonderful, featuring as it does an amazing choral/vocal arrangement, hinting at classical music before the band’s progressive urges take over! The listener will love ‘Atlas Stone’ with hints of Queen, this is a marvellous song, very grandiose and plenty to listen out for on each repeated listen. ‘As Death Embraces’ will move the coldest spirit, a very moving piece and not unlike the mellower moments from Dream Theater. A real musical treat from start to finish and this band have so many musical ideas crammed into this album, however they never lose sight of the melody in a song even on the epic songs. This entry was posted in ALBUM REVIEWS, ALBUM REVIEWS (Mobile), All Posts and tagged album review, Dream Theater, Haken, Inside Out, prog metal, Queen, Ross Jennings, The Mountain. Bookmark the permalink.